There have been many contributors during the recent hot stretch of Mets baseball. The bullpen has looked strong lately and the bats are collectively on fire. 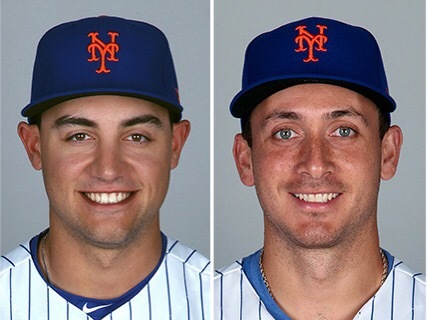 But Michael Conforto and T.J. Rivera have been key difference makers in my mind. Conforto had two hits in the leadoff spot last night and T.J. had three hits in the two hole. They’ve made this recent stretch of baseball so fun. When men are on base for Conforto or T.J. I always feel confident they will come through with a clutch hit. Conforto has arguably had the biggest impact on the club this year. He’s breaking out and helping carry the team without Yoenis Cespedes. We needed a hero, and he’s been just that. Rivera on the other hand needs to stay in the lineup. When Lucas Duda returns the Mets need to either put Rivera at third base or second. They need to reconfigure things to ensure he gets playing time. Everyone’s Hot: It’s certainly not just T.J. and Conforto carrying this team. Lately it’s been a new hero every night. On Monday when the Mets beat the Giants 4-3, Neil Walker had an RBI ground rule double in the first inning and a walk off RBI single in the ninth inning. Rene Rivera also had two hits in Monday’s game. He’s hitting .321. No way that lasts, but I’ll enjoy it for now. Yesterday’s Heroes: Last night the Mets beat the Giants 6-1. The Mets put up a four spot in the first inning. Neil Walker hit a two RBI triple and then Jose Reyes and Rene Rivera added an RBI single and double respectively. T.J. Rivera hit an RBI double in the fifth inning and Conforto hit a solo blast late in the game. The team has pulled back to .500. Life is good. Mighty Pen: The bullpen has been rock solid this week pitching 6 scoreless innings in the two victories against the Giants. Jerry Blevins has been clutch all season. Jeurys Familia has looked good in the ninth. People are saying that Terry’s decision to pull Familia in that game a few weeks back and bring in Josh Edgin kind of woke him up. I’m pretty sure he just needed some time to shake off the suspension rust but whatever. Believe what you want. Quality Starts: Jacob deGrom certainly wasn’t efficient in terms of pitch count on Monday, but he’s been like that all season. He struck out 11 over 6 innings and gave up 3 runs. Zack Wheeler (Mr. Inefficiency) pitched 6 innings and gave up 1 run on 2 hits and 4 walks last night. The importance of Wheeler’s presence this year cannot be overstated. Even with all the walks and short outings he’s been one of the few reliable starting arms. Bum Wrist: On Monday the Mets decided to fly Gavin Cecchini from Vegas to New York for a promotion, and then they decided they would rather keep injured Asdrubal Cabrera on the roster. They are truly insane. I’m hoping they plan to put Cabrera on the DL when Lucas Duda is available to return because he clearly needs 10 days off. That would also take care of the “where do we play T.J. Rivera” question. The Tearful Apology: Yesterday the Mets held a press conference where Matt Harvey apologized to his teammates and the fans for going out drinking on Cinco De Mayo and then missing Saturday’s game due to a hangover. Harvey was seemingly on the verge of tears, Terry Collins was getting choked up, and the players all said they are ready to move forward. Even Bartolo Colon texted Harvey to offer words of support. In my opinion, this was all totally unnecessary. I’m in the minority on this one. Most fans feel Harvey’s behavior was outrageous and appalling, and that he owed everyone this apology. People were calling for the Mets to trade him or demote him and on and on. I think this entire Harvey situation was ridiculous, avoidable, and created by the Mets. Harvey went out late, got drunk, and blew off work. Generally speaking that’s unacceptable behavior when it comes to work. It’s definitely doesn’t fly for a professional athlete. But the Mets could have quietly fined Harvey, had him apologize privately to his teammates, and then moved on. That’s what “keeping it in-house” actually means. Instead the team told the media everything that was going on and had a ridiculous emotional press conference. The Mets and some members of the media have now given the fans and general public the impression that Matt Harvey has a drinking problem, is depressed, and that he’s on the verge of an emotional breakdown. Is that true? I don’t know. I’m not one to joke about substance abuse, depression, or any psychological issues. But I think it was wrong of the Mets to make this a big public spectacle. I realize that Harvey partially brought this on himself by being out in public partying and cutting off contact with the team. He is partially to blame. But I think as usual the team made a mountain out of a molehill. Either way I’m happy it’s over.